The 2nd Amendment: Shall Not Be Infringed! I have the right to keep and bear arms. So do you if you are an American citizen, legal resident or even a visitor. People ask if illegal aliens also have this right and the answer is yes, sure, but they have no right to be in the U.S. in the first place, so they should be granted their rights under the 5th Amendment to have a speedy and public trial and be deported back where they came from. Remember, the rights in the Bill of Rights are considered to be natural rights or God given rights. The Bill of Rights doesn’t grant us our rights, it protects them from government. As natural rights, everyone in the world has them, but the United States is the only place that recognized that these rights must be protected from government infringement. The Bill of Rights isn’t necessary to grant us rights. It’s important, because it reminds us that we have rights and who is out to take them from us at all times: government. Notice that The 2nd Amendment doesn’t say anything such as, “The people are hereby granted the right to keep and bear arms.” It assumes the right already exists. It says, “The right of the people to keep and bear Arms, shall not be infringed.” In other words, the right is there already. It isn’t in question. The only expressed mandate the 2nd Amendment puts forth is that it forbids anyone from infringing on this right. 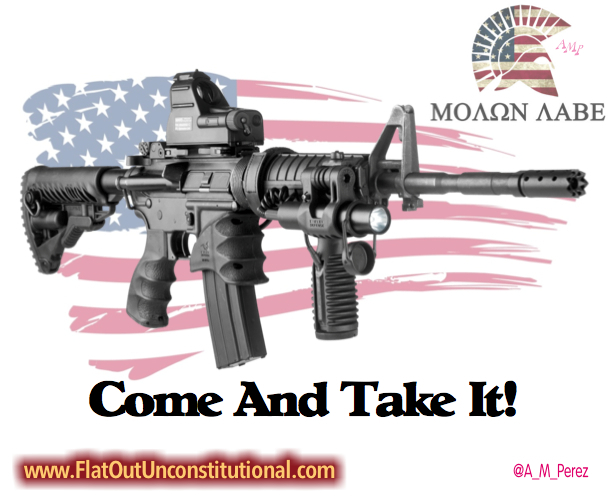 It doesn’t say, “shall not be infringed by Congress,” in the same way that the 1st Amendment only restricts congress. It doesn’t say, “Shall not be infringed, except by state and local governments,” nor does it say, “shall not be infringed, unless you’re a felon or have a mental illness.” It’s very blunt when it says, “shall not be infringed.” There are no caveats. Once the unconstitutional Gun Control Act of 1968 was passed, making it illegal for felons to own guns, government has found many more ways to make felons out of millions more Americans. Isn’t that convenient? How safe will a military veteran with PTSD be if we’re told that people with mental illnesses can’t own guns? It is our responsibility and duty to stand up against tyranny and not to allow government to create some form of 2nd class citizen who has their rights revoked in the interest of feel good policies that can’t possibly prevent bad people from doing bad things. Only law abiding citizens follow laws. People who commit evil acts don’t check to see if the law allows it first. Why should people who have served time in prison or someone who struggles with wartime memories be prevented from protecting themselves or their families? How many school shootings have been done by felons with illegally obtained guns? None that I know of and yet the shootings still happened and by people who passed unconstitutional background checks. The left has done a great job of indoctrinating people, so that blind ideology replaces reason. Leftists actually favor the government disarming the populace, ignoring the history that has proven this to be one of the first steps of genocide every time. They ignore the definition of words and the sentence structure of the 2nd Amendment to come up with the fantastical claim that the 2nd Amendment only allows people who are part of a government controlled militia to have guns. The 2nd Amendment doesn’t say, “the right of the militia to keep and bear arms, shall not be infringed.” The most radical among leftists will claim that the 2nd Amendment can only apply to muskets, since that is all we had when the Bill of Rights was ratified. Well, the truth is, no, muskets weren’t all we had, but that point is moot. The 2nd Amendment doesn’t say, “the right of the people to keep and bear muskets, shall not be infringed.” Private citizens, not government, owned the war ships when the Revolutionary War began. Private citizens still can, although they’d cost a lot. The Constitution still allows Congress to grant letters of marque for privateers. Leftists often accuse conservatives of disliking the militia part of the 2nd Amendment. Nothing could be further from the truth, because we are able to read. It recognizes the fact that a militia is necessary to the security of a free state and a well regulated militia, at that! Who can argue with that? We have several hundred well regulated militia in the United States. Notice it doesn’t say “government regulated” or “government controlled.” Since long before the time of the Revolutionary War, militia regulated themselves. Being well regulated was a common term, which meant that it was to be kept in good, working order. The men in the militia were to be kept trained to respond when called upon and they were to maintain their own arms in good working order and stay supplied with the proper ammunition. It was a pretty simple concept, which still applies today, but in an effort to thwart the 2nd Amendment, the left takes it upon itself to try to redefine words. They try to interpret the 2nd Amendment in such a way as to say that it requires government regulation of militia. They use the term “interpret” to describe their blatant misreading of the 2nd Amendment, claiming that the Constitution is a living document, meant to change with time. If that is the case, and it can mean anything you want it to, why was it ever written down in the first place? Why write down your mortgage or any contract for that matter? The 2nd Amendment sets no requirement for the people to be in a militia. It notes that militia are necessary for freedom, and keeping the militia well regulated is the key. Militia are made up of people and are not a regular or standing army, so it is incumbent upon the people to keep and bear arms in accordance with their God given right. The right of the people doesn’t change with regard to their militia membership or lack thereof. The 2nd Amendment says no such thing. It doesn’t even come close to setting any kind of requirement on the people. This is the problem with leftist interpretations. They make things up, pulling baloney out of thin air and convince themselves of utter nonsense, then expect the rest of us to buy their hokum. The 2nd Amendment makes no limitations on the types of arms the people can keep and bear. Our founding fathers overthrew the most powerful government in the world at their time. They wanted the people to be better armed than the government which served them. The notion that only the government should have weapons of war and that the people don’t need such things is ludicrous. When we’re told that we don’t need machine guns, we have to stop reacting by saying things like, “machine guns are illegal already.” Every law that says machine guns are illegal is unconstitutional and we should fight those laws, not capitulate to them. It’s also false to say that people can’t own machine guns. We can, we just have unconstitutional requirements put on us, such as having to register them. Also, when told that we need universal background checks, we have to stop replying with, “we already have background checks,” or “there is no gun show loophole, gun show vendors do background checks too.” No, we need to repeal the 1993 Brady Bill and get rid of background checks altogether. They not only violate the 2nd Amendment, but also the 4th and 5th Amendments. Where is their warrant? Why are you forced to incriminate yourself? We must stop compromising liberty away one piece at a time. The 2nd Amendment is meant to ensure that we the people are more powerful than government. It is not there to enable hunting. It is there for the sole purpose of protecting freedom, mostly from oppressive governments whether they be foreign or domestic. It is illogical to recognize any power of any level of government to sell us permission to exercise our rights in the form of permits or to allow that government to decide who can bear arms and which arms. Whether or not you join a militia is up to you. Work with other militia members to keep it well regulated if you do. Well regulated militia are necessary to the security of a free state. It wasn’t the army who came to the rescue at the Bundy Ranch when freedom was under attack, it was militia and they were well regulated, especially with the assistance of modern social media. Keep and bear arms! It is your right. You do not need permission. Laws that say you can’t bear arms are unconstitutional. Work to repeal or nullify those laws. They infringe on your right. The right of the people to keep and bear arms, shall not be infringed! You can’t be expected to take on powerful government agencies on your own, so join groups that give strength in numbers and make these issues count at the ballot box. Remember, just because a government wields power doesn’t mean they have the legal or constitutional authority to do so. It only means they are stronger than you. That is why the founding fathers saw it necessary for the people to be armed better than government. They already saw what happens when government wields too much power. When the TSA frisks you and asks you questions in airports in direct violation of your 1st, 2nd, 4th, 5th, and 10th Amendment rights, they do so without any legal authority. They get away with it, because they are more powerful than you. If we the people stood against it in mass, their power would be nullified. Their power requires willful compliance by the masses. Each of us goes through the TSA line as an individual, knowing that the masses aren’t going to rise up against the infringement on our rights, so the best way to tackle this tyranny is through the Congress and our courts. Had four people maintained their 2nd Amendment rights on September 11th, 2001, we could have had a happier story to tell of that day. There is never a good reason to give up your rights, as we see with every mass shooting and most gun violence that occurs in the United States. What they almost all have in common is that they occur in gun free zones or gun free cities. We have a lot of work to do in order to shut down the TSA, but that doesn’t mean you ever have to become a victim in any other gun free zone. It’s only a gun free zone if you let it be and if you do, it’s only a gun free zone until it’s not. Criminals don’t follow laws or care what signs say. The gun control leftists have never provided a solution that would prevent crimes. Their solutions only affect law abiding citizens. The majority of us go along with the laws, because that’s what we’re taught to do. If they ban something, we quit doing it. Countless people lost their jobs and businesses because of bars closing across the country do to smoking bans. The few bars which nullify these bans by ignoring the law actually do well. thousands of bars have closed, because they dutifully followed the smoking bans. Even with the loss of livelihood, most law abiding citizens march in lock step to follow the law. Gun control laws are no different and only affect those who have no intention of committing crimes. However, the people are fed up with gun control. People are no longer going along to get along with the assault on our 2nd Amendment rights. Connecticut recently passed draconian gun control laws requiring the registration or turn in of so called assault weapons. The people said, “No!” Even the police said that they will not attempt to enforce that. Washington State passed laws requiring background checks for any gun trade or sale between two people. The people answered by holding a massive gun trade on the Capitol steps in direct violation of the unconstitutional law. If any of you gun control NAZIs out there want our guns, you are just going to have to come get them yourselves! Arm yourself and your family. Take part in training classes and go to the range to practice shooting. It’s great fun and it never hurts to brush up on your skills. That’s what being well regulated is all about. Be a well regulated family! Guns, ammo, and all sorts of shooting activities also make fantastic gift ideas, for birthdays, Christmas and even Valentine’s Day! Have fun and stay safe! Previous The Democrat Debate: I watched it, so you don’t have to! Next The 3rd GOP Debate! My Synopsis! I have a question. You said there several hundred well regulated militia across the U.S. How would these militia “execute the execute the Laws of the Union” pursuant to Article 1, Section 8, Clause 15 ? They either are called forth by states or by themselves. Notice Congress only “provides for” calling forth, they can’t “call” forth. Operative verbs are important. They can provide. This is an excellent question! I have been wanting to know about this as well. “The Congress shall have Power To …provide (make available for use) for calling forth the Militia to execute the Laws of the Union, suppress Insurrections and repel Invasions” (Article I, Section 8, Clause 15). Continuing to the next sentence/section: “The Congress shall have Power To …provide for organizing, arming, and disciplining, the Militia, and for governing such Part of them as may be employed in the Service of the United States, reserving to the States respectively, the Appointment of the Officers, and the Authority of training the Militia according to the discipline prescribed by Congress” (Article I, Section 8, Clause 16). Congress “provides” (that is “make available for use”) “the Militia of the several States” (ARTICLE II, SECTION 2, CLAUSE 1) for the occasion when Congress exercises its power to “call [ ] forth the Militia” in order to “employ” them “in the Service of the United States” for any of their three enumerated constitutional purposes: “execute the Laws of the Union, suppress Insurrections and repel Invasions”. That is when the President becomes “Commander in Chief…of the Militia of the several States, (Article II, Section 2, Clause 1), when called into the actual Service of the United States.” At all other times “the Militia of the several States” are in the service of the several States where they reside—that is the other “Part” of the Militia which Congress does not “govern [ ]”, which is “reserved to the States respectively”. Further study of history would reveal that Congress has in fact and law “call[ed] forth the Militia” to “employ” them “in the Service of the United States”. You can’t start off by adding words to the Constitution. Congress can provide for calling forth the militia. Congress can’t call forth the militia. Congress has done a lot of things that is unconstitutional. They rarely do anything that is constitutional anymore. No words were “added to the Constitution”, a couple were merely defined as to their meaning. Congress governs “Part” of the Militia, the “Part” it may “employ[ ] in the Service of the United States”. Employ them to do what? To “execute the Laws of the Union, suppress Insurrections and repel Invasions”. Therefore, Congress has a constitutional duty to “provide for organizing, arming, and disciplining, the Militia”, otherwise the Militia could not effectively perform their three enumerated constitutional responsibilities when Congress “call[ed] [them] forth” to “employ” them “in the Service of the United States”, which is the “Part” of the Militia that Congress “govern[s]” according to the supreme Law itself. Even with no knowledge of pre-constitutional legal history, this is grade school level reading comprehension. Congress has “call[ed] forth” the Militia and has “employ[ed]” them “in the Service of the United States” for their three enumerated constitutional purposes to: “execute the Laws of the Union, suppress Insurrections and repel Invasions”. And that has activated the President’s role as “Commander in Chief…of the Militia of the several States”—in accordance with what the Constitution requires in its own words. To assert “Congress can’t call forth the militia” one must disregard the very words in the Constitution itself. More than 150 years of pre-constitutional history would reveal how the Militia functioned as a matter of fact and law, a pattern followed by the Articles of Confederation, then the Constitution. One has to know what is “constitutional” in the first place before they can assert something to be “unconstitutional”. I can read English, I don’t need your definitions or embellishments. No, read it again. “…governing such Part of them as may be employed in the Service of the United States…” The key word is “employed.” Notice it doesn’t say “drafted.” It’s up to the militia and it’s parts whether or not they allow themselves to be employed by anyone. Not Congress. Congress can’t call forth jack. They can provide for calling the militia forth. They can PROVIDE FOR organizing, arming, & disciplining them too. Only provide for. No, Congress has no Constitutional duty for providing for them at all. They merely have Constitutional PERMISSION to do so. If it’s their duty, I want my arms provided for NOW! Where is my gun and ammo welfare? But this begs the point, of that of which we cannot speak: When is a militia activated and for what purpose? Because in my interpretation of a host of America’s problems, many long in the making, the time for action has passed. Well, they activated at Bundy Ranch, but then flopped in Oregon. Sad. If an armed mob of lawbreakers claimed to be active militia, how does the average person know the difference? Would it really be hard to figure out? Anyone who’s been in that type of situations wouldn’t have to ask. What distinguishes from law breakers (vigilantes) calling themselves militia ? Has there been some problem with militia breaking laws? I’ve never seen it happen. Is there some reason you trust government to make that distinction? In the military, impersonating an officer is a crime. There are credentials that can prove officer status. So the states appoint militia officers ARTICLE I, SECTION 8, CLAUSE 16. How do we know who these militia officers are? I am aware that the militia are not the military. I was asking that since states appoint militia officers under ARTICLE I, SECTION 8, CLAUSE 16. How do we know who these militia officers are? There has to be a process for appointing them. if the state calls forth their militia how are the officers identified? Depends on the state laws, in my state the State only appoints the rank of general. All other ranks are done by the individual militia units. This is codified in our states militia law. You’re right, what you say is solid yet though it’s old established law it’s as if it’s a new idea. Our right to bear arms is clouded by the endless sewage of propaganda designed to take it away. So amidst all of that Your piece is informative and refreshing. One thing sure, when we give up our God given rights we can’t go back, we can change our mind but we’ll never ever be able to re-declare that owning and bearing arms is a God given right and it be the law of the land The time to choose if we want to keep our God given rights is before a crisis and, what we will do to protect ourselves and our rights from anyone trying to take them away. I wonder, particularly in the light of quotes such as the one from Richard Henry Lee above, what the constitutional basis for taking guns from people in prison is. I can see a common-sense basis for it, of course, but it seems to be in opposition to the absolutist position taken by the 2nd amendment. Do you have any thoughts? Great piece; I agree with it all with the exception of your points on the TSA. Thanks. However, there is no enumerated authority in the Constitution for the federal government to police us or provide security by stripping us of our rights, so it’s not exactly debatable. The TSA is, like almost every federal agency, an unconstitutional agency. Respectfully, the case for the TSA is in the preamble, “…to provide for the common defense…” There’s no constitutional right to fly, and anyone has the right to refuse or withdraw from screening. It’s unconstitutional for America to grant titles of nobility. Great article, Anna. Here are some quotes from founding fathers and statesmen to support you, in case any naysayers show up. The power of the sword, say the minority…, is in the hands of Congress. My friends and countrymen, it is not so, for the powers of the sword are in the hands of the yeomanry of America from sixteen to sixty. The militia of these free commonwealths, entitled and accustomed to their arms, when compared with any possible army, must be tremendous and irresistible. BTW The DOJ is now going to use Unconstitutional Means (Patriot Act, Arbitrary Listings of Terrorist–>”Bill of Attainder”) to go after people who believe in the Constitution as written. And as you can see in the Huff post article they are lying when they claim that the Police feel that the biggest threat to America is the “Sovereign Citizen” and Constitutionalists” or are they? Someone is passing the Propaganda hat around….. In all these cases where you show violation of certain rights, inclusion of the 9th may be warranted. Although written in a topsy-turvy manner, in order for it to be true, it’s mirror image must also be true. In other words; “The Enumerated Rights must be guaranteed to the ‘People’ as written for the 9th amendment, to hold water.” Give it a few seconds and it will hit you hard. Check this out Anna. You mentioned the 1968 GCA. Not only do I agree with your assessment, but it is clearly Unconstitutional; whereas it took rights from individuals “Ex Post Facto.” In 1934 they made people surrender automatic weapons and silencers “Ex Post Facto.” In 1996 they took gun “Rights” from 4th degree assault (misdemeanor) people “Ex Post Facto.” This last one was done by the DOJ, an agency granted “Title of Nobility” (creating punitive regulation with out congress). Don’t even get me started on “Bills of Attainder” via “Civil Forfeiture.” To say this is Capricious is an understatement. Something worth consideration; When Temperance came along, they knew it would require an Amendment to the Constitution for a valid “Prohibition of Alcohol” to take place. Ever since then they have been creating Agencies by the begillions. I believe it was 1943 when the Supreme Court ruled that Agencies had, in some cases “Moral Obligations” the create regulations, which is clearly a violation of Article 1, sections 9 and 10. Even more troubling is that they are violating virtually every clause in section 9, and no one seems to grasp the importance of these acts. Much more troubling is that the Agencies they create, are creating Regulations designed just for their own growth and existence. This needs to end, and soon, or we are in very deep trouble. It’s also the reason I’m very concerned about a Trump Presidency. Thank you for your post this morning. I enjoyed reading it while having my coffee. I’m feeling good today especially after starting my day with your thoughtfulness to remind me of my right to keep and bare arms. Have a great day.